Social media is quickly becoming one of the most over-used buzzwords since the recession brought on the ‘credit crunch’. But what is it? And why should someone aspire to work in this field? The most succinct definition states that: Social media relates to a group of internet based applications that build on the foundations of Web 2.0 by facilitating the creation and exchange of user generated content. This includes social networking sites, forums, wikis, blogs and micro-blogging platforms, etc. So what exactly can you glean from that very technical definition? Social media is impacting traditional communication models and changing the way companies do business. With the advent of the internet, users are no longer confined to passively receiving information through the mass media. The constant rise in the number of competing products and services means that a company needs to stand out in order to make money. Traditionally, small businesses relied on word of mouth and referrals to set themselves apart. Meanwhile, big companies with huge marketing budgets used expensive advertising campaigns to capture their consumers’ attention, increase brand recall and drive sales. Social media has changed those models. One customer’s rant on Twitter can go viral in seconds and produce negative publicity for the company, which undermines ad campaigns that cost millions. At the same time, one person “liking” or “becoming a fan” of a local restaurant that is on Facebook may encourage their friends to visit. The availability of information on social media means that people are reacting to the brand, while the world watches, faster than many companies can identify and respond to what happens. Here’s my own recent experience. 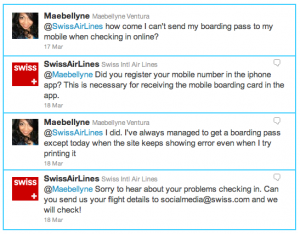 SITUATION: I name-checked Swiss on Twitter about my difficulty getting a boarding pass. Lo and behold, they replied several hours later and asked me to email my flight details. As I found out when I got there, the mobile phone scanners at Birmingham Airport weren’t working on the day that I flew out. In all fairness to them, Swiss on Twitter didn’t know this was happening. But I never did find out why I couldn’t print my boarding pass. VERDICT: The Swiss social team did well replying to my tweets, although they could have responded faster. The service broke down a little bit on email when I received a corporate sounding response informing me that not all airports are mobile-ready and Birmingham Airport was one of them. This was despitethe fact that I have successfully used a mobile boarding pass in the past when flying out of Birmingham. They couldn’t offer me an explanation in their email on why I was having technical difficulties printing my pass and basically ignored the question altogether. This just goes to illustrate the need for those responsible for a brand’s social media to be more than just marketing people, they need to understand the operations of the business, be empowered to investigate and deal with specific customer’s complaints. There was also a notable difference in the responses I got from Twitter and through email. I have no idea whether both accounts are being handled by the same team but Swiss was more engaging on Twitter than on email. Maybe 140 characters makes us sound more human and email has just become too formal. On the plus side, their team replies to emails even on a Sunday. It was nice to know that their social media team is not constrained by traditional Monday-Friday operating hours. Social media is where customer service, marketing and public relations intersect. Facebook, Twitter, and a whole host of other social networks are engaging people in more ways than any one person could have ever imagined. Companies like Swiss as well as mega brands like Burger King, Coke and Ford to name a few, are leveraging these applications to communicate with their customers. They aim to develop customer brand ownership through online engagement and in turn, gain publicity by demonstrating how their customers are interacting with their brand. In theory, this fosters loyalty while simultaneously helping to acquire new customers. The cost of using social networks is obviously cheaper than traditional advertising campaigns. Although, the return on investment is still difficult to quantify. Did the Mentos and Coke video on YouTube translate to more bottles sold as it went viral? Who knows? But I’m pretty sure a lot of people thought about trying the experiment themselves using Coke as opposed to Pepsi. A successful social media team will have a strategy that incorporates intelligent marketing, good public relations and nimble customer service. An effective social media executive should be operationally capable, well-informed, empowered to remedy issues, versatile and committed to serving both the company and the end-consumer.